Located along the Malabar coast, Kerala boasts about 600 km of shoreline. 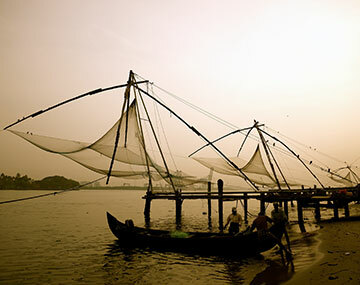 It is renowned for its backwaters, palm-fringed beaches. As you head inland, you will be welcomed by aromatic tea, coffee and spice plantations and wildlife reserves like Thekkady and Periyar. Of course, there can be nothing more romantic then spending a night in a houseboat that cruises along the stunning and mesmerizing backwaters of the state. Also, Kerala is home to Munnar, which is a hypnotic hill station. So, Kerala definitely has what it takes to make Kerala honeymoon packages a grand success. Your honeymoon should be well-planned so that you can focus on giving your married life the start it requires to be a success. Our Kerala honeymoon tour packages are planned with you in mind. We realize the importance of honeymoon and ensure the packages contain just what you need to make your honeymoon memorable. And, you will be surprised to learn that our Kerala honeymoon package price is pocket-friendly so you will not burn a hole in your pocket. I had a nice time in kerala , tea garden covered most of the part of the mountains and the waterfall. Bookotrip thank you!! !